One-half mile south of N.H. Route 12A on Old Cheshire Turnpike over Great Brook in Langdon. The bridge is 34'6" long with a clear span of 27'0". It has an overall width of 18'10" with a roadway width of 16'1", and a maximum vertical clearance of 11'7". It is closed to vehicular traffic. 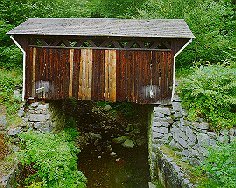 The Prentiss Bridge is the smallest covered bridge in New Hampshire. It was built by Albert S. Granger and is the third bridge on this site. The date of the first structure is unknown but the second was built in December 1791 on land cleared and settled by John Prentiss in 1785. In 1805, the Cheshire Turnpike Company took over the bridge as part of the turnpike from Canada to Boston. On March 10, 1874, the town voted to raise $1,000 to replace the old structure with a thirty foot Granger covered bridge. It served the community until it was bypassed in 1954 and now serves foot traffic only. It is also known as the Drewsville Bridge. The Langdon Bicentennial Committee will provide the materials for a local volunteer effort to repair both the Prentiss Bridge and the McDermott Bridge. The Prentiss Bridge is listed on the National Register of Historic Places.